How fortunate that, with modern technology, the most subtle of nuances in a performance can be successfully captured in a recording. The music of the great French master Claude Debussy - who revolutionised and pushed the boundaries of tonal harmony, and also discovered new sound and expressive possibilities for musical instruments - is reproduced in this high resolution quality recording like never before. 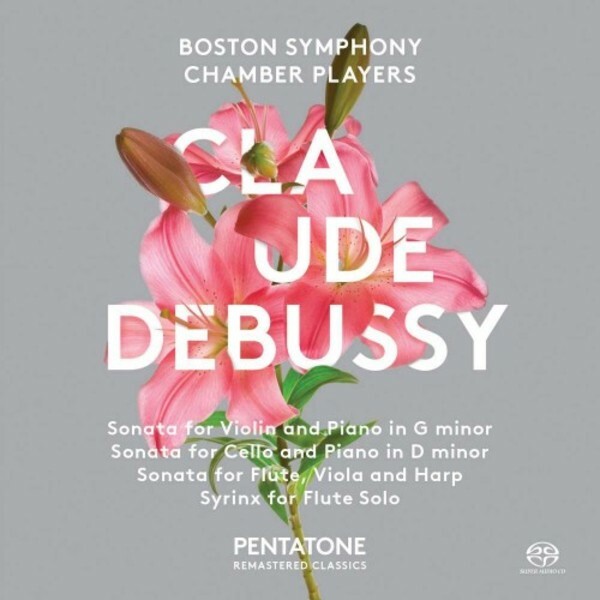 The three chamber music works represented here were all written in the last three years of Debussy�s life and are a fusion of the styles he used to adopt throughout his composing career. The cavalier and Moorish flavour of the Cello Sonata, the subtly seductive Violin Sonata and the beautifully transparent Sonata for Flute, Viola and Harp are masterfully performed by members of the legendary Boston Symphony Orchestra, with the great Michael Tilson Thomas at the piano. As an added bonus, we have the mystical Syrinx for solo flute which completes this beautiful album.